(1 Customer Reviews) | Write Review 5 issues per year Trying to understand what is Vladimir Putin’s next move? Want to know more about the crisis in Ukraine? Looking for historical and cultural figures that shape Eastern Europe? Then look no further. Put New Eastern Europe on your reading list by downloading the New Eastern Europe App and gain access to the most important issues facing our region today. This issue compiles the best articles appearing on New Eastern Europe's web page into the format of our quarterly magazine. We are offering it FREE of charge and encourage you to download and read your copy on your mobile device. 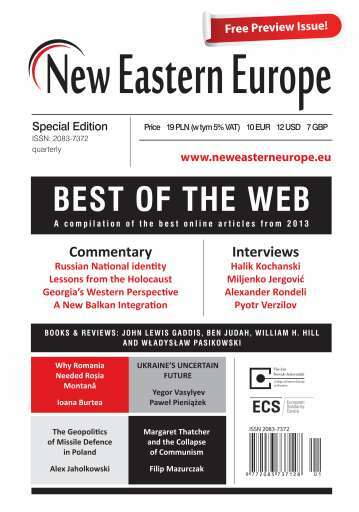 If you like what you read and want more issues like this with exclusive content on Central and Eastern Europe, please subscribe to New Eastern Europe for iPads and Android devices. You'll receive 5 issues during a 1 year New Eastern Europe magazine subscription. New Eastern Europe Looked Through Cold War Eyes - There is nothing new or objective in this magazine, it Russiaphobia on steroids. Rather than embrace the new opportunities for trade and culture between Eastern European nations, Russia included, it looks at how to paint everything in terms of opportunities for destabilising relations between Russia and her immediate neighbours. It's everything that is wrong with "Western" thinking at this time, which is progressively becoming more Fascist towards anything that does not conform to its "world view" and business interests. You'll receive 5 issues during a 1 year New Eastern Europe magazine print subscription.